Alma the Younger served as the high priest of the church during the first nineteen years of the reign of the judges. He served a dual role of high priest and chief judge for the first eight years but afterwards resigned from serving as chief judge in order to concentrate on improving the spirituality of his people. 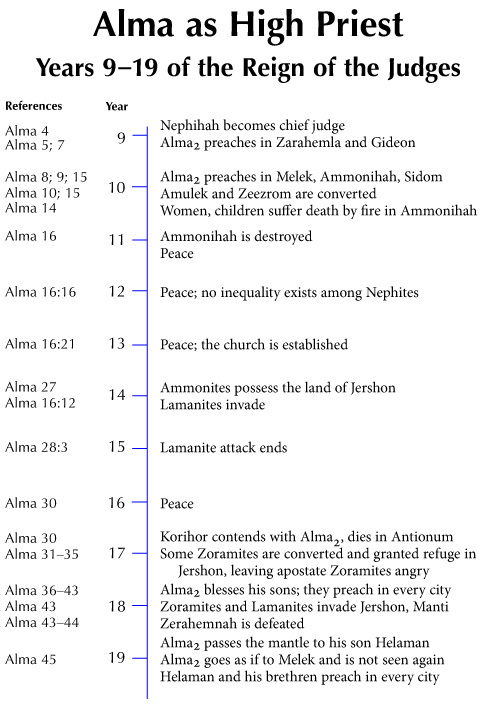 This chart illustrates some of the more important events that took place during years 9–19 of the reign of the judges (83–73 B.C.). Among other things, Alma assisted in the conversion of Zeezrom, preached to the city of Ammonihah, contended with Korihor, and led missionary activities to Antionum. After this period of faithful labor, Alma journeyed toward the land of Melek and was not seen again. Some supposed that he was taken up by the Spirit and received by the Lord (see Alma 45:19).